Never previously partners but in Daejeon the combination of the host nation’s Lee Sangsu and DPR Korea’s Pak Sin Hyok have formed an immediate understanding, the chemistry works. Safely through to the last eight of the Men’s Doubles event at the Seamaster 2018 ITTF World Tour Platinum Shinhan Korea Open; on the morning of Friday 20th July, they advanced one step further; they booked their place in the semi-finals. The no.5 seeds, they beat a most creditable partnership in the guise of China’s Liang Jinkun and Yan An, the former powerful, the latter very quick to seize the initiative at the earliest opportunity. 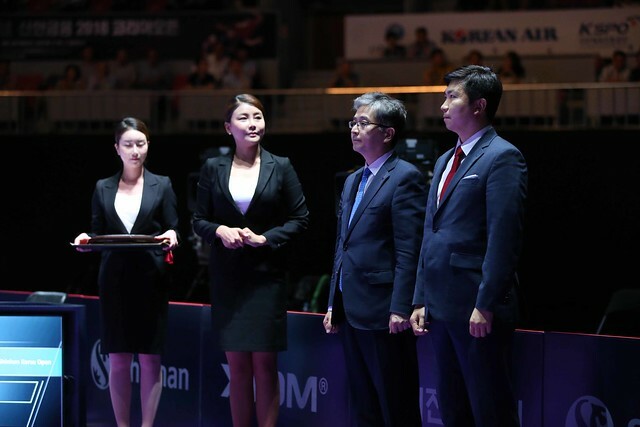 However, with Pak Sin Hyok being left handed and Lee Sangsu right handed, the Korean Peninsula duo could unleash their powerful forehand top spin strokes at will; in a hard fought full distance duel they recorded a full distance five games success (11-9, 13-11, 3-11, 4-11, 11-7). A fine performance but arguably the performance of the round was that provided by Korea Republic’s Jang Woojin and Lim Jonghoon; the no.6 seeds, they upset the order of merit, they overcame Koki Niwa and Jin Ueda, the no.3 seeds (12-10, 5-11, 11-8, 11-4) thus ending the hopes of Japan. Success for the Korean Peninsula, for Hong Kong it was mixed fortunes. Lam Siu Hang and Ng Pak Nam, the no.8 seeds, experienced defeat at the hands of China’s Wang Chuqin and Xue Fei (11-9, 11-9, 11-6); conversely Ho Kwan Kit and Wong Chun Ting, the top seeds, recovered from a two games to nil deficit to beat Chinese Taipei’s Chen Chien-An and Chuang Chih-Yuan, the no.7 seeds (3-11, 11-13, 11-9, 11-7, 11-9). Once again for Chen Chien-An and Chuang Chih-Yuan it was disappointment; crowned World champions in 2013 in Paris but to date they have never reached an ITTF World Tour Men’s Doubles final. At the semi-final stage Ho Kwan Kit and Wong Chun Ting confront Lee Sangsu and Pak Sin Hyok; Jang Woojin and Lim Jonghoon face Wang Chuqin and Xue Fei. Notably each partnership comprises a left and right hander. The matches will be played later today in the evening session of play.